Are Your Ready to Ignite Your Candle Making Desire? Candle making is a lot like making bath bombs. You can fully experiment with scents and colors. Even choosing the containers for candles is a whole lot of fun! And just like making bath bombs, you never know exactly how the color or scent will come out until you use it. 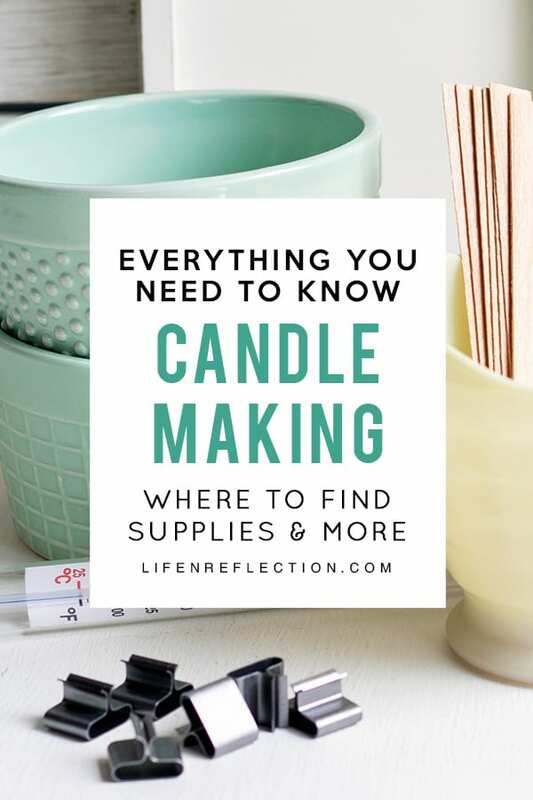 But, there’s a few things you should consider before gathering your candle making supplies. Unfortunately many store bought candles are filled with chemicals such as carcinogens and phthalates (Farley, 2016). Never heard of phthalates? They are hormone-disrupting chemicals that are a health risk to babies, young children, men, and women (Powers, 2007). Phthalates can aggravate asthma and are linked to increased incidences of breast cancer (Stuart, 2016). Anytime we are burning typical store bought candles, chemicals can linger in our home. Which in effect can cause the air in our homes to become fairly unhealthy. Luckily, we can leave the chemically made candles at the store and make our own! I can attest that picking up supplies for candle making can be inconvenient. It can take what seems like half a day trying to find the supplies you want and need. So, I’m including a link where possible to order online as we talk about the soy candle making supplies you’ll need. Have you ever noticed a small wire in the center of cotton candle wick after lighting it? Well, that wire happens to be a lead core and when burned it emits lead into the air. Yep, that’s pretty crappy right? But, did you know is it illegal to manufacture candles in the United States with lead-cored wicks? While, that is great news, candles made overseas and sold in the U.S. can still contain lead. With that in mind, wood wicks make a great alternative to cotton wicks. They are non-toxic, eco-friendly, and can be readily made from organic renewable resources. You’ll also need little metal clips to hold the wood wicks in place like the ones in the photo above. And as a bonus wood wicks add to the ambience of a beautiful flickering flame with a soft crackling sound. It is reminiscent of cozy night spent by the fireside. What’s not to love? Paraffin wax is the most commonly used wax in candles. Unfortunately, it is a byproduct of the petroleum industry. As such paraffin wax releases toxic carcinogens including acrolein, acetaldehyde, and formaldehyde according to the EPA ( Knight & Levin, 2001). Natural waxes like soy and beeswax are excellent sources for candles. 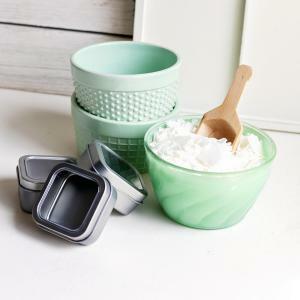 In fact, you can make a half dozen soy wax candles at home in just an hours’ time all while leaving the yucky stuff out! And what I really love about soy wax – it’s non-toxic, biodegradable, renewable, and cleans up if spilled with just warm water. I buy my soy candle wax by the pound in flakes here. It’s really easy to measure out that way. You truly can use a variety of options for containers. 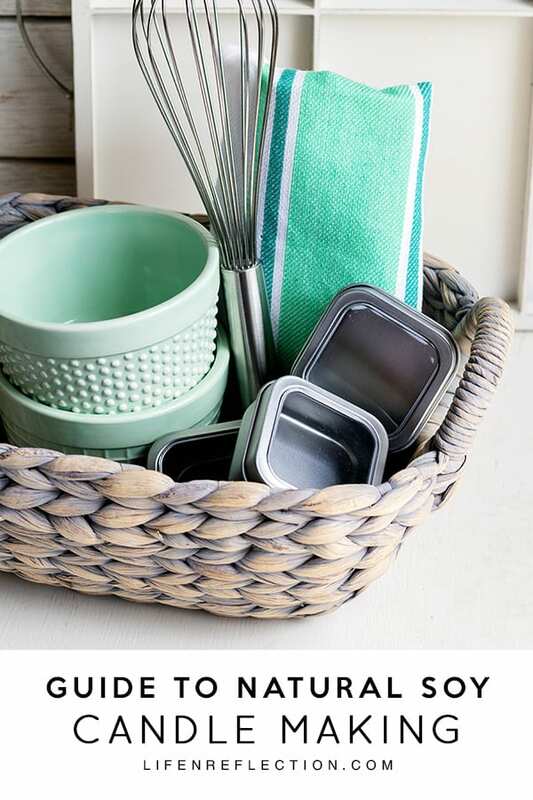 Take stock of your pantry for containers like mason jars. Or visit your local antique shop for tea cups and other unique containers. I personally love these 4 ounce amber glass jars with lids and metal candle tins. Sometimes I find colorful ramekins in the thrifty Spot section at Target. And when I’m feeling very creative I make lemon bowl candles as seen in the top left corner of the photo above. This one always seem to throw people off. What is a candle making pitcher? It’s a big pitcher to melt wax in. Can you melt wax in a pot on the stove? Sure, but that’s pretty messy and really difficult to pour the wax. A candle making pitcher has a spout and a plastic handle that stays cool. Which makes pouring candles a breeze. This is the candle making pitcher I use, it holds up to four pounds of wax. See it in the bottom right corner of the photo above. How Do You Fragrance Non-Toxic Candles? 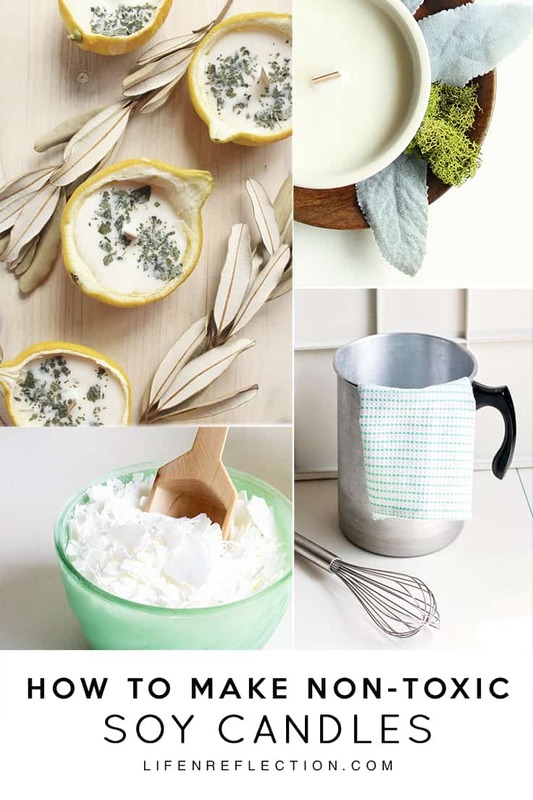 It’s easy to create your favorite candle scents with essential oils and natural extracts. How much essential oils to do you use to make candles? I recommend adding a half an ounce to one ounce of essential oils per one pound of wax. If you are combining a few different essential oils like lemon and rosemary make sure to split up the amount. The same goes for using natural extracts like pumpkin spice or caramel. What are your favorite candle scents? I’ll be honest the first time I made candles was stressful. Worry about burning the wax, getting the wicks in the center of each container, and adding the scents at the right temperature – is a lot to handle! But, you know what? They turned out great! And I was hooked from the start on soy candle making. What temperature do you pour soy wax? Overall soy wax should be poured at anywhere between 120 to 140 degrees fahrenheit. Keep in mind, soy wax can be quite sensitive to temperature as it is a softer wax than the typical paraffin. Do not heat it above 200 degrees fahrenheit to avoid burning and discoloration. 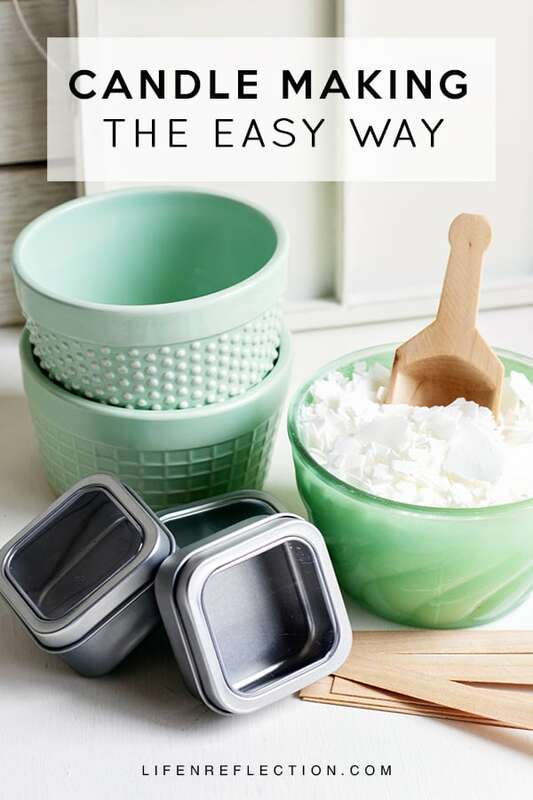 What’s the best temperature to add essential oils to soy wax? Fragrance oils for candle making come with flash points listed on the labels. Essential oils do not. Which can make it difficult for figuring out what temperature to add essential oils to soy wax. In my experience if you add essential oils at a temperature above 125 degrees fahrenheit the scent does not blend well. I see the best results by adding essential oils at 120 degrees fahrenheit with a two minute stir. How much wax do you need for a candle? The answer to that requires a bit of math. So get your calculator, just kidding. You’ve got this! 1 pound of soy wax is equal to 16 ounces. So, if you want to make two 8 ounce jars you’ll need one pound of wax. The same goes for four 4 ounce jars. When measuring soy wax flakes use a kitchen scale to get an exact measurement. Otherwise you’ll be left to much wax or not enough for your containers. Are you ready to begin soy candle making now? Browse my candle making recipes here. Have more questions? Pop one in the comment box for me below! Farley, P. (2016) Essential Oil Diffuser Recipes: 100+ of the best aromatherapy blends for home, health, and family. CreateSpace. Charleston, SC. Knight, L and Levin, A. (2001). Candles and incense as potential sources of indoor air pollution: market analysis and literature review. Environmental Protection Agency. Research Triangle Park, NC: Report EPA-600/R-01-001. Stuart, A. (2016) Go Lo Tox. New South Wales, Australia.